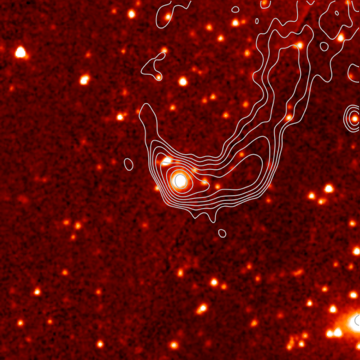 Radio Galaxy Zoo: How were the images made? Today’s post is from Enno Middelberg, RGZ science team member and astronomer at Ruhr-University Bochum, Germany and expert in interferometry. Enno has kindly agreed to share some details of this complex and highly useful technique for improving the resolution of images. Radio waves from cosmic objects have been observed since the 1930s, starting with Karl Jansky and Grote Reber. In the beginning, astronomers used single telescopes, some of which looked more or less like TV antennas (and some looked just weird, for example Karl Jansky’s self-made telescope). Whatever the telescope looked like, astronomers understood very well that the resolution of their instruments would never be quite as good as at optical wavelengths. The fundamental reason for this has to do with diffraction theory and Fourier transforms, but the outcome is rather simple: the smallest separation on the sky a telescope can “resolve”, which means, that it can actually tell that there are two things and not one slightly extended thing, is given by the fraction λ/D. Here, λ represents the length of the waves observed (some centimetres in radio astronomy), and D represents the diameter of the telescope (some tens of metres). One can easily calculate that this fraction is of order 0.001-0.004 for a radio telescope, but for an optical telescope the number is much smaller, of order 0.00000005 or so. This means that optical telescopes could separate things on the sky which were much smaller together than the first radio telescopes. Astronomers had tried to improve on this early on, using something called interferometry. The wavelengths could not be changed (otherwise they wouldn’t be radio telescopes any more, right? ), and telescopes could only be made as big as 100m (otherwise they would be too heavy and too expensive). So astronomers took two of the telescopes they had and combined their signals into one. Such a contraption with two telescopes is called an interferometer, and its resolving power is no longer given by the diameter of the dishes, but by their separation. So simply moving the two telescopes further away from one another would increase the resolution – what a fantastic idea! In the 1960s, this technique was much advanced by British astronomer Sir Martin Ryle in Cambridge, and he was awarded the Nobel Prize in Physics for his work in 1974. In the following decades, Martin Ryle’s innovation was improved upon by astronomers all over the world, creating radio interferometers of various sizes and forms. Radio telescopes sprouted like mushrooms. Ever more powerful telescopes were build: the Very Large Array, theAustralia Telescope Compact Array, the Effelsberg and Greenbank giant single dishes, and many more. Most recently, technical advances have made it possible to build completely digital radio telescopes, such as Lofar. Even though these instruments consist of many more than two radio telescopes, the measurements are always made between any two of them: the Very Large Array, for example, has 27 telescopes, which yields 351 two-telescope inteferometers. Using many more such interferometers improves the image quality and, of course, the sensitivity of the final images. 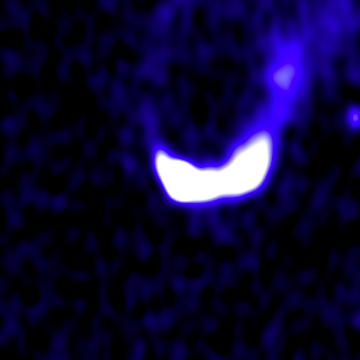 Radio image with faint emission visible, at the cost of losing details in the bright spots. The radio images you’re seeing here are the results of the Australia Telescope Compact Array Large Area Survey (astronomers love acronyms! ), or ATLAS for short. Between 2006 and 2009 we have collected data on two small regions in the southern sky to create the basis for an investigation of the way that galaxies evolve. We have used these data to create the radio images you’re seeing when you classify sources. The infrared images were made with the Spitzer telescope, to compare the radio to infrared emission. Radio and infrared waves are not necessarily emitted by the same material and can therefore be displaced from one another in a galaxy. That’s why we need your help to determine what radio blobs belong to which infrared blob!